World's fastest Polo launched in India, but only 99 will buy it! World’s fastest Polo launched in India, but only 99 will buy it! Earlier today, Volkswagen officially launched its most expensive, and fastest hatchback in India. Let’s start with the pricing. It is priced at a massive Rs 25.99 lakhs ex showroom Delhi. The company has only imported 99 units in the first lot and is said to have already received 100 bookings. The GTi badge is a legendary one that started with the Golf GTi way back in the 1970’s. This was the ultimate hot hatch at that time and people who have driven the car still love it for what it offered back in the day. 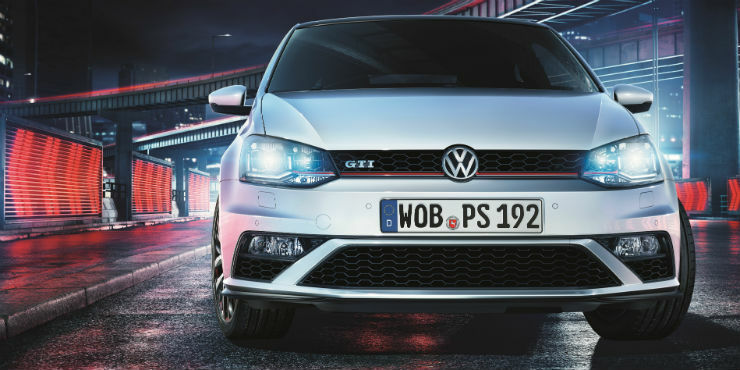 This legendary brand has finally made its way to India in the form of the Polo GTi. One word, CBU. CBU stands for completely built unit, in other words a full import. A full import means exorbitant duties and a higher RTO tax. If VW assembles this car in India, the price could fall well below the 20 lakh rupee mark. However, that’s not happening anytime soon. What do I get for spending quarter a crore? Powering the GTi is the same 1.8 liter TSi turbo petrol unit from the group which produces 188 Bhp and 250 Nm. Since the engine comes mated to a 7 speed DSG in India, and not the 6 speed manual (offered as an option internationally), the torque figures are limited. The car does 0-100 in 7.2 seconds and has a top speed of 233 kmph. In the looks department, the GTi only comes in the 3-door variant which means a cooler and sportier look. The car features full LED headlamps with DRLs. There is a new new honeycomb grill with a red highlight which extends all the way into the headlamps, a signature feature of the GTi. The car also has a more aggressive front bumper. At the rear, there is a black tint on the tail lamp cluster to make it look better and there is a dual exhaust tip as well. Globally, there are only 4 colour options on offer – red, white, silver and black. The blue doesn’t come our way though. The Indian spec car has to make do with smaller 16″ alloys as standard, but there is an option to opt for 17″ ones. 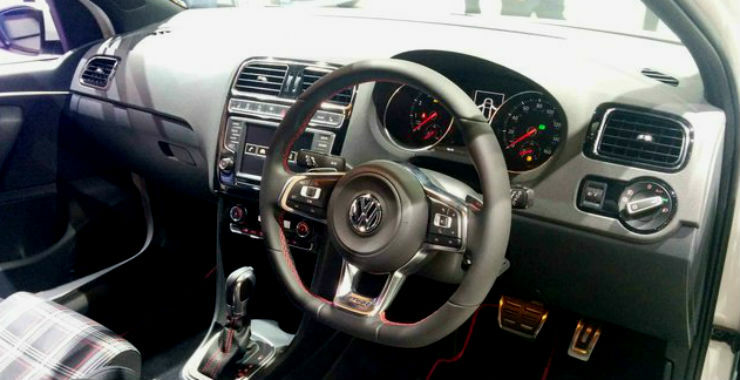 On the inside, the first thing that you will notice is the GTi steering which is lovely to hold. It not only looks great but also has great bolstering. And of course, it has the much required paddle shifters. The seats are finished in the typical GTi cloth upholstery as opposed to leather. Since this car is a hot hatch and isn’t exactly meant for practicality, let’s not talk about space. On the features front, the car will be offered with a touch screen system which support MirrorLink like on other VW cars. In addition to that, it will feature front and rear parking sensors, a new instrument cluster, heat insulation on the side windows, 6 airbags, electronic differential lock and rear disc brakes, something the GT missed out on. Surprisingly, there are a quite a few alternatives to the GTi. There is the Abarth 595 and the Mini Cooper S who are direct competitors for those looking for a hot hatch, but not a budget. For those who want similar power and practicality can also look at the Octavia, Audi A3 since both have the same 1.8 liter TSi unit and offer better practicality. On the other hand, there are people out there who have modified their existing Polo GTs to make them real quick and there are ‘go-faster’ mods for the Punto Abarth that can make it quicker as well. The GTi is a special product but it is too pricey for what’s on offer. For those who cannot spend that much but are looking for a hot hatch, the other options on the cheaper side are the Polo GT twins, the Punto Abarth, the soon to be launched Tiago Sport and Baleno RS. You could also look at the Ford Figo Diesel since it has 99 Bhp on offer. Yes, this car is more on the expensive side and we would have preferred it to cost around the Rs 20 lakh mark. But the company is branding the vehicle as the GTi and given the fact that it is going to be very limited and exclusive, there are a few crazy enthusiasts out there who will end up getting the car.